On November 27, Sri Lankan Tamil people observe Great Heroes Day (Maaveerar Naal). It honors the memory of militants who fought for the Liberation Tigers of Tamil Eelam during the Sri Lankan Civil War. The Tamil people are a South Asian ethnic group who speak Tamil as their mother tongue. Regions with significant Tamil populations include India, Sri Lanka, Malaysia, Singapore, and Indonesia. Members of the Tamil ethnic group native to Sri Lanka are known as Sri Lankan Tamils, Ceylon Tamils, or Eelam Tamils. Relations between the majority Sinhalese and minority Tamil communities of Sri Lanka have been strained ever since the country proclaimed its independence from the British Empire in 1948. Rising tensions led to the formation of the Liberation Tigers of Tamil Eelam (LTTE), a militant organization that advocated the creation of an independent state of Tamil Eelam. An insurgency led by the LTTE led to a full-fledged civil war that lasted for almost 26 years, from 1983 to 2009, and resulted in the defeat of the Tamil Tigers. Over 30 countries currently list the Tamil Tigers as a terrorist organization. Sri Lankan Tamils, however, regard the LTTE militants who died in combat as heroes. Their memory is honored on November 27, the date on which Lt. Shankar (the first LTTE cadre to have died in combat) is said to have been killed in 1982. On the occasion of the remembrance day, Sri Lankan Tamils light oil lamps and hold public gatherings. 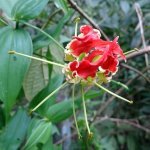 The symbol of Great Heroes Day is flame lily (Gloriosa superba), a flowering plant that blooms in November.